This year will be my first Mother's Day! Although my eight month old won't be giving me any handmade card (can't wait for when he does) just the thought of sharing the day with him and hubby is the best feeling. But what do you get the new mom? Geez I don't know. I could use quite a few things but in reality something useful is always best. Any new mom will tell you that you spend more on the new baby than on yourself. Every time I go grocery shopping I can't help and pick something up from the Joe Fresh baby line. Rarely do us moms actually pick something up for ourselves. So, it's nice to get treated. Umbrella: yes, an umbrella! Not just any umbrella but a cheeky worded umbrella. I love to go for walks with my baby in his carrier and taking out the stroller in the rain can be a pain in the arse. A large rimmed umbrella would make a great gift! Bath/Spa goodies: I do love LUSH and more so when it's a gift. Especially when they release limited edition gift packaging that you can re-use. I love the bath bombs and body lotion in this set. 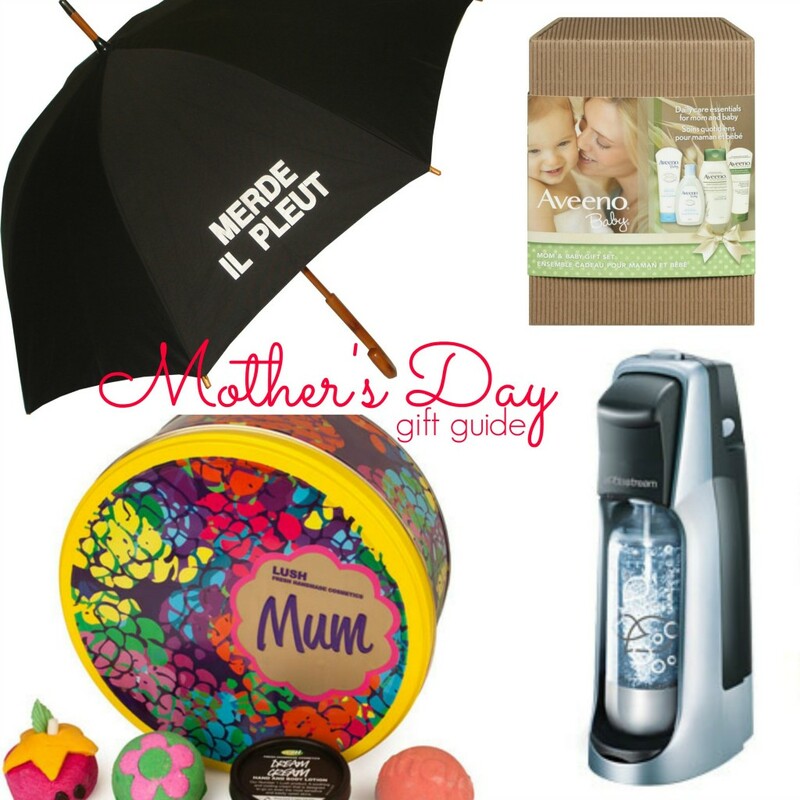 body care: Aveeno Mom & Baby Gift set is great for that first time mom. Something for both! I love the Aveeno baby line for my little guy. I actually use his Aveeno baby body moisturizers (my fave the night time lavender scent). soda maker: yes, I like soda and you can make your own at home. Forget boring soda and enjoy countless flavours. This Summer I'll be sipping refreshing Italian sodas from my rooftop patio.